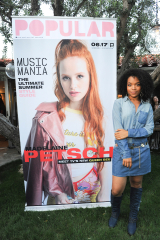 Wildfox x POPULAR teamed up on Monday to celebrate Riverdale star and POPULAR covergirl, Madelaine Petsch, with a VIP event, held at a private residence in Los Angeles, CA. Guest included: Madelaine Petsch, Travis Mills, Indiana Massara, Allegra Acosta, Saxon Sharbino, Brighton Sharbino , Madison Iseman, Ashley Jackson, Hannah Beth, Greer Grammer, DJ Caroline D’Amore, and many more. Click through our image gallery for your exclusive first look at all the action.